Frederick Peter Rosback was a machinist and inventor. 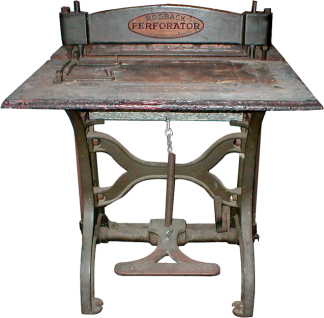 In 1881 he started the Rosback Company in Chicago with the invention of a foot-powered tool for the bindery that could perforate paper with small metal pins. It was used to create paper that could tear easily such as stock certificates, stamps, and checks. Available in a variety of sizes from table-top to stand-alone models, the perforator is fairly simple to operate: slide paper under a row of pins (using guides to set margins) then depress the foot pedal to punch holes. Some models have metals bars that can be removed, allowing the operator to bypass a section of pins to create shapes beyond uniform lines and squares. A helpful tip for successful perforating is the use of waxed paper, punched every so often, to lubricate the pins.